It looks like something out of a science-fiction movie, but it's real. 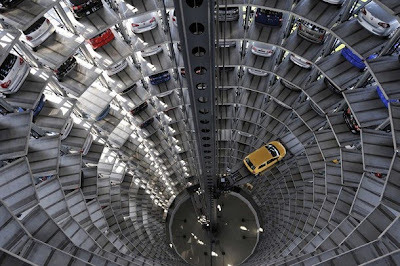 This is an actual 20 story car tower that takes up just 20% of the space of a conventional parking garage handling the same number of vehicles. 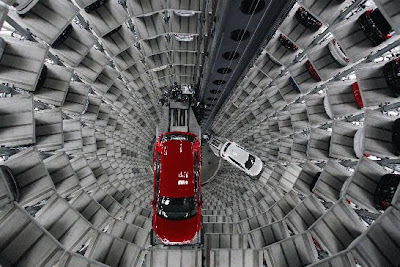 Volkswagen uses the facility in a showy delivery process for its new car customers. 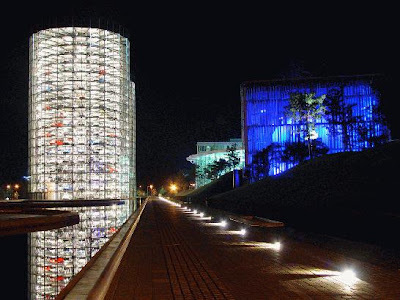 Volkswagen's Autotürme, or car towers, are distinguishing features of the Autostadt. 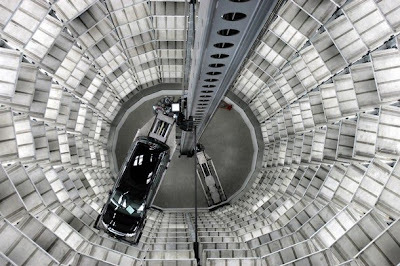 The transparent cylindrical buildings rise 150 feet above the grounds, and they're linked by a fully automated delivery system to both the Volkswagen factory and theKundenCenter (where VW customers pick up their new cars). 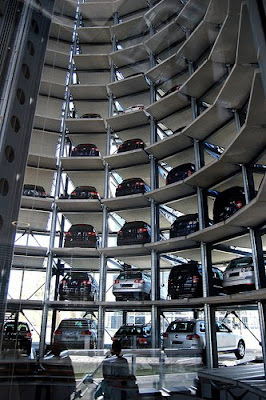 "In a fully automated procedure, your new car is brought down to you from one of the 20-story Car Towers. Large signboards in the Customer Center show you when your turn has come. Then, you're handed the keys, your picture is taken, the glass doors open and your brand-new car appears. You're all set to go." More than just a car-park.